This has the same matrix and uses the same firmware as the 4x4x4x4x4. The GNAP! was split into 3 equal sized 4x4 matrices. 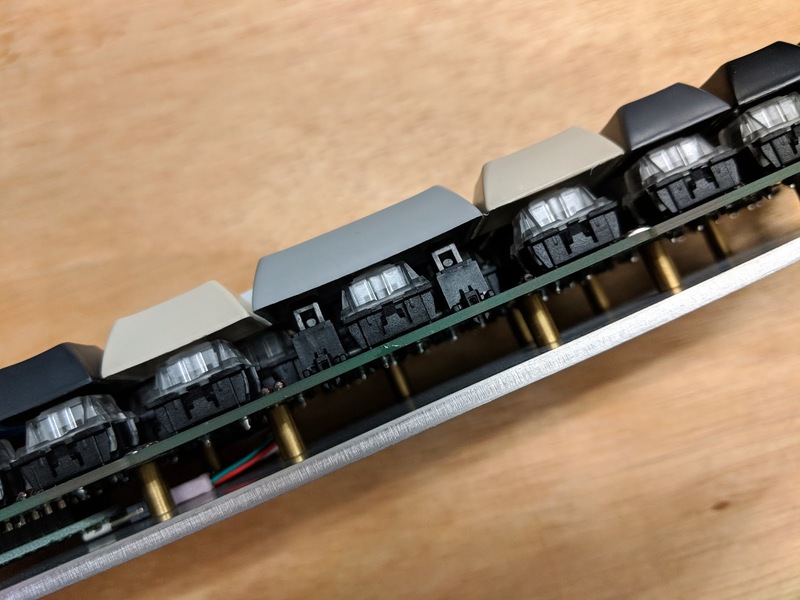 The board edges were routed to fit together and then solder bridges hold the pieces together and create the electrical connections. Each individual PCB is under 100mm square. JLCPCB.com has a $5 special on sub 100mm PCBs. The 3 PCBs. Left, Middle and Right (Right, Middle and Left since they are upside down). 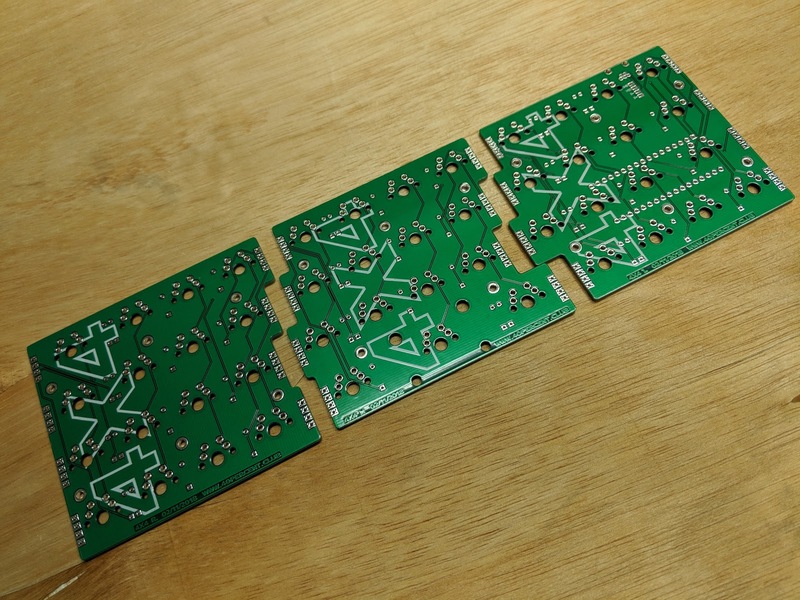 The pairs of boards fit together very precisely. 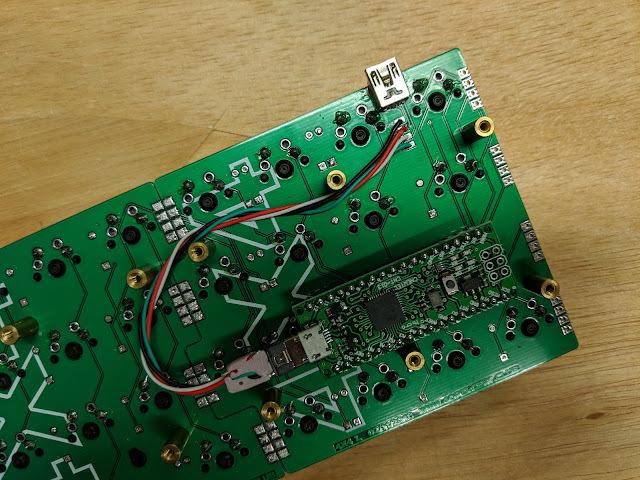 The relative position of the components to the board outline is a tiny bit off, not enough to be noticeable without measuring. 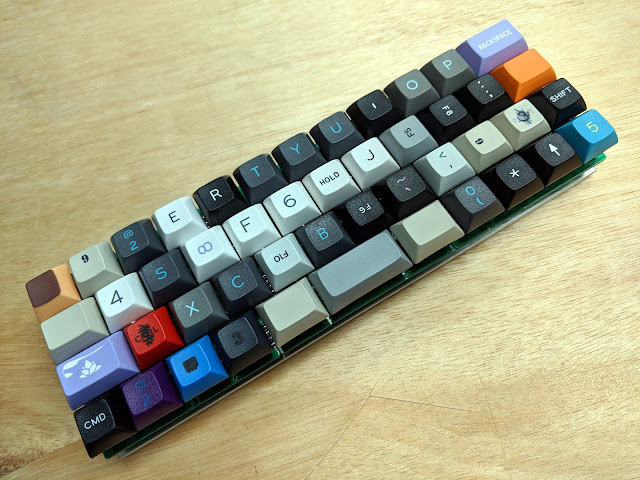 The assembled board with keycaps. It looks and performs like a regular GNAP!. 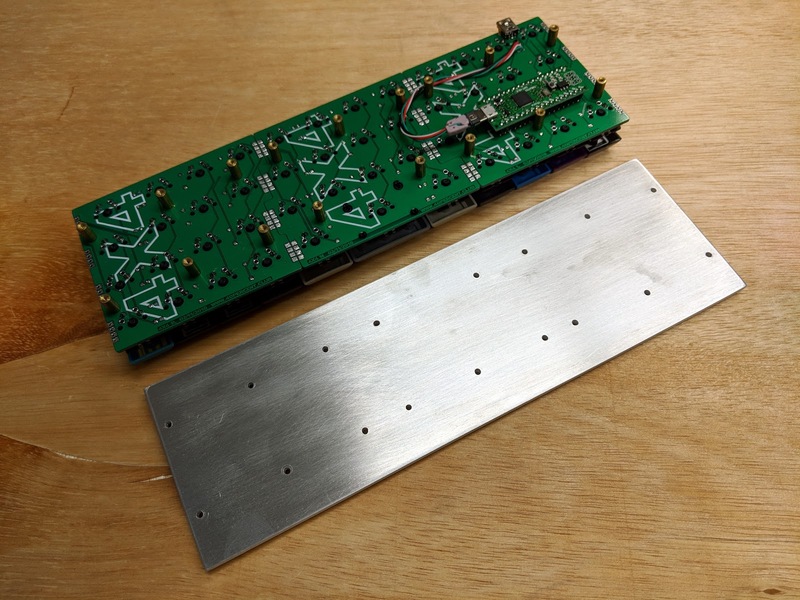 M2 spacers and screws secure the PCBs to a 1/8th inch thick 3 x 9.375" piece of 5052 aluminum. The aluminum was purchased on eBay. There are several sellers that will custom cut for a reasonable price. A pigtail is used to connect the Arduino Micro clone to the Mini USB connector. The holes for each PCB are spaced differently, the bottom will only attach in one orientation. An assembled set of PCBs were used as a template to drill the holes. Side view of the sandwich construction. 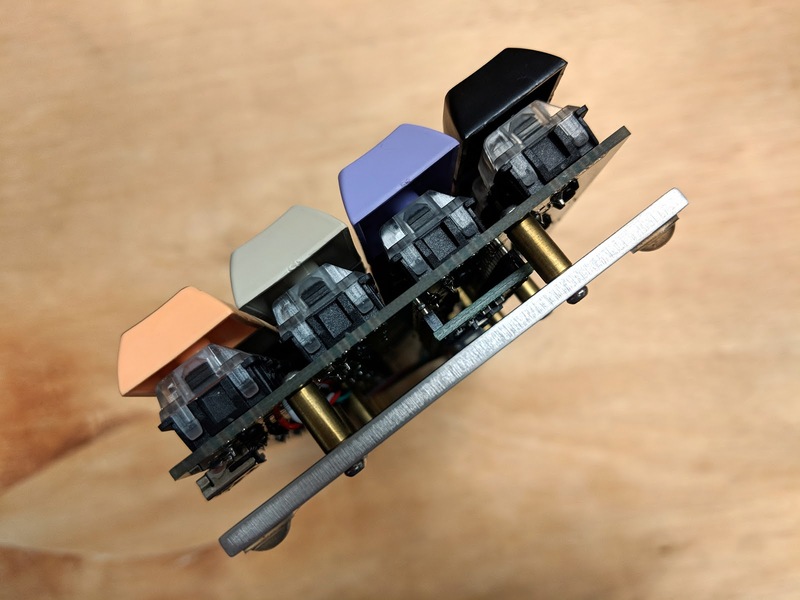 There is no plate, so PCB mount switches are required. The 2U keycap is supported by a Cherry PCB mount stabilizer. 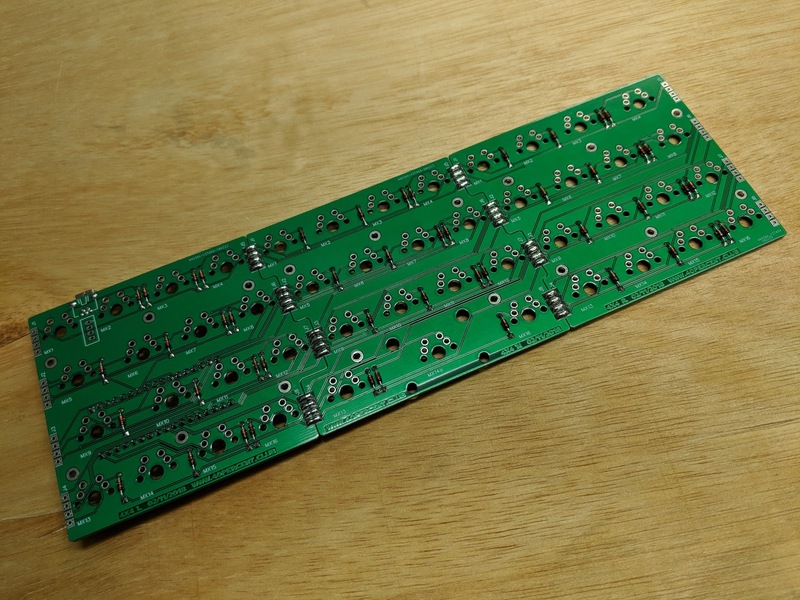 The bottom of the assembled PCBs. It is possible to add an additional 4x4 PCB to either the left or right side, making it a full 4x16 matrix. If a 4x4 PCB is added to the left side the Arduino Micro clone will need to be moved to the left most board. Closeup of the pigtail. It is a regular cheap Micro USB cable cut up. The texture on the bottom of the solder bridges is from the blue painters tape I used to hold the pieces in place during soldering. 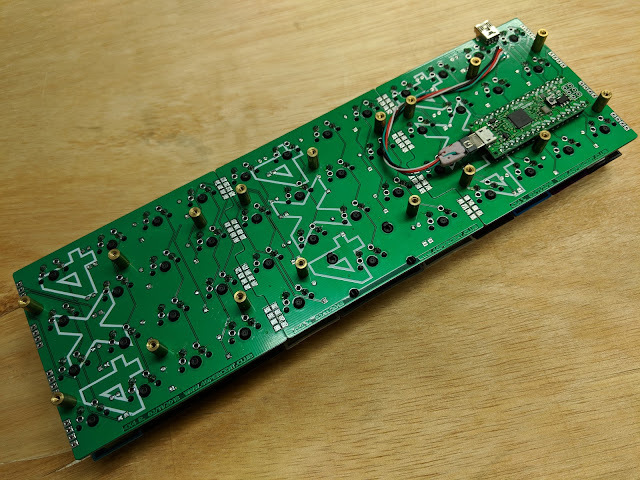 The top of the assembled PCBs. 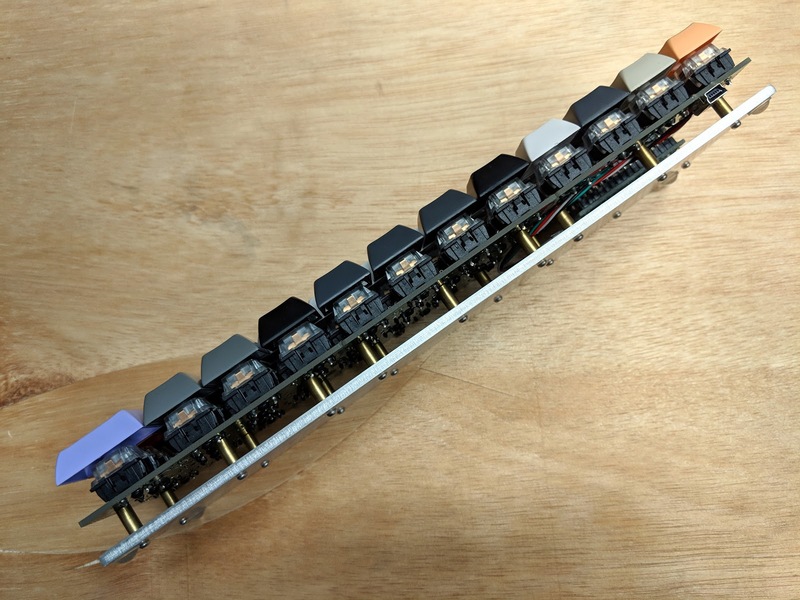 You can see the solder bridges holding the boards together. The interlocking board shapes and offset rows of solder bridges creates a very rigid board once assembled.